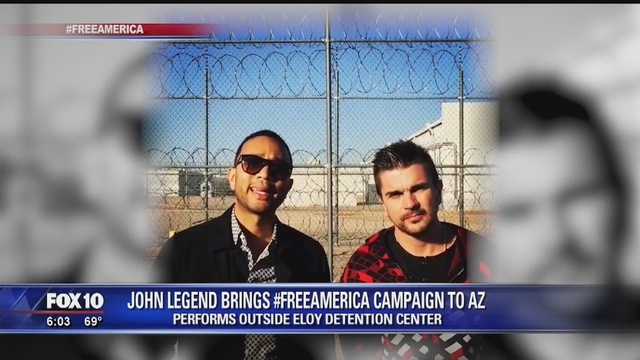 Colombian musician Juanes and singer John Legend met immigrants at a jail in Arizona on Wednesday before performing for a small crowd outside the facility to draw attention to immigration and mass incarceration. The Grammy winners each played two songs separately and one together — Bob Marley’s “Redemption Song” — as dozens of people sang along in Eloy, about 60 miles southeast of Phoenix. “The reason why we’re here, one, is because we want to bear witness to what’s happening so we could tell the world about it,” Legend said to the cheering crowd. The performers’ original intention was for the detainees to hear the music. But organizers were told the inmates were not let out of their cells to hear the concert. Earlier, Juanes and Legend took a tour of the detention center and spoke to detainees inside. Juanes said in Spanish that he was “heartbroken” by what he saw. “It’s very hard to understand that someone is deprived of their freedom unjustly, and that’s why we’re here with our music, with our culture, which is the strongest tool to bring attention and give a voice to those who don’t have one,” he said. Legend said the immigrants have gone through a great deal of hardship. Maria Gomez, of Phoenix, said the singers’ visit will let immigrants know that people care about them. The 16-year-old said her brother and other relatives are being held in Eloy after traveling from Mexico City to Nogales, Arizona, where they sought asylum. Gomez said her family had been victims of kidnappings for ransom. “It’s something very special because not any artist would do this,” Gomez said. Francisca Porchas, of Puente Arizona, which helped organize the event, said her group’s goal was for the singers to meet the detainees and families who have been fighting against strict immigration policies and raids. She said she hoped the visit would give detainees hope. “For them it’s something very important that they know they’re not forgotten,” Porchas said. The organization transported about 60 people to the event in vans, while others drove on their own. Puente has been a vocal critic of the Eloy Detention Center over the deaths of several inmates because of suicide and medical problems. The group says immigration authorities aren’t transparent about what goes on inside the jail. “This afternoon, residents of the Eloy Detention Facility’s south side were confined to their cells and residence pods for approximately one hour after concerns arose that an unsanctioned concert being conducted within view of the center’s south recreation yard might provoke a disturbance. The decision to briefly restrict residents’ movement was made out of an abundance of caution for both detainees’ and employees’ safety,” the agency said. Legend founded Free America, a campaign that aims to reform the criminal justice system.